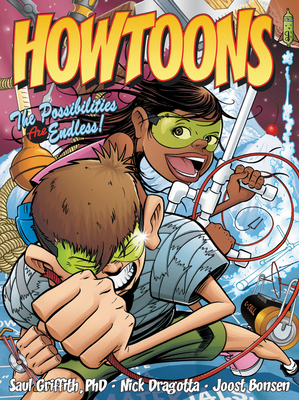 Part comic strip and part science experiment, Howtoons shows children how to find imaginative new uses for common household items like soda bottles, duct tape, mop buckets, and more–to teach kids the "Tools of Mass Construction"! Howtoons are cartoons that teach 8– to 15–year–old readers "how to" build, create, and explore things. Combining a fun, full–color cartoon format and real life science and engineering principles, Howtoons are designed to encourage kids to become active participants in the world around them. Readers meet Tucker and Celine, a lovable brother and sister pair. Sick of watching TV and playing video games, Tucker and Celine decide to conquer every kid's nightmare: the dreaded summer o' boredom. Armed with countless ideas for fun projects, they set out to reclaim the sheer joy of playing. Fifteen practical, build–it–yourself projects are weaved into the Tucker and Celine storyline. With the narrators' help and clear step–by–step instructions, young readers will learn how to set up a workshop, create a marshmallow shooting gun, make ice cream without a freezer, play songs on a turkey baster flute, explore a homemade terrarium, launch a pressure–powered rocket, and more! Utilizing inexpensive, kid–friendly materials, Howtoons will prove that the world at large is infinitely more exciting than anything happening on the TV or computer screen. Plus, each project will provide readers with practical skills and problem solving know–how that they can use in their everyday lives. These funny, interactive Howtoons are sure to inspire independence and creative savvy in young people everywhere.